Caps fans were spoiled the last two seasons, obviously not in terms of watching their beloved team skate away with a championship, but in ways they’ve learned to take for granted: Offseason anticipation and positivity. Everyone gets psyched for the season when the team has a stacked roster, and good things did happen. The Caps were the best team in the league the last two years during that grueling 82-game schedule. Two straight Presidents’ Trophies. King of the regular season mountain, sitting up there and flipping off the rest of the NHL for those few days before the stupid playoffs began. Most folks measure success in sports by championships, but if fans of the Caps, Canucks, Sabres, Panthers, Senators, Sharks, Blues, Blue Jackets, Wild, Jets, Predators, and even the Golden Knights did that, we might as well not even watch. 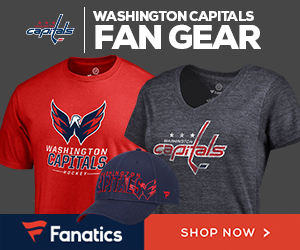 I’ve met several fairweather Caps fans who only start paying attention during the playoffs, then criticize the franchise’s existence once they’re eliminated. I’m unclear why these folks even watch, but they’ll be the first to jump on the bandwagon once the team breaks through. Because of this all-in hangover from the past two years (which would’ve happened even had the Caps won the Cup), fans and pundits aren’t as jacked for Washington’s 2017-18 season, and with good reason. Some players got much-deserved fat contracts, which didn’t allow for other good players to return, which left space for a bunch of newbies, who need to prove themselves but will likely suffer growing pains as most players do, which will lead to more losses, which doesn’t usually translate to playoff success. Even Brian MacLellan said he doesn’t believe the Caps will win a third straight Presidents Trophy this coming season. Despite that, the Caps still have… an All-Star goaltender, a proven backup goalie, nine returning regular forwards, four returning regular defensemen, a power play that’s still likely to be among the top in the league, and plenty of opportunities for prospects to make their mark. So, believe, Caps fans, cause that’s all you can do. Anything but that, and there’s really no reason to watch.